Village of East Hills > Headline News > Kids in the Park > Special Puppet Program Park at East Hills! 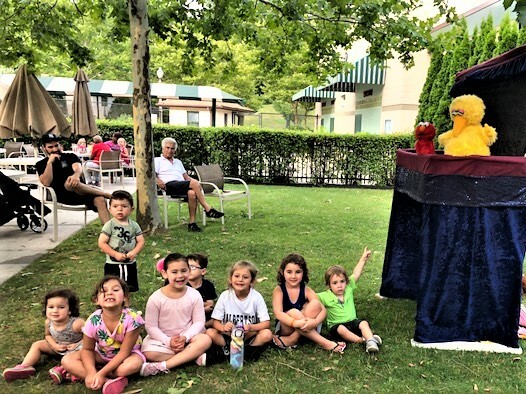 On Monday, July 23, 2018, Big Bird and Elmo performed at The Grille. The response was an overwhelming success. Presented by the “Kids in the Park” Committee, as part of the popular “Sundaes on Mondays” program, the show was a big hit for youngsters. “It was wonderful to see families attend and enjoy the entertainment. Thank you, Allyson Stumacher, for organizing the puppet shows,” stated Supervising Trustee of the Kids in the Park program, Stacey Siegel. Every Monday through August 27, 2018, from 5:00 pm to 7:00 pm, East Hills children can enjoy a special priced Kids Meal at the Grille for $9 plus tax which includes a make-your-own ice cream sundae. Any children who missed this puppet show can attend the next and last one is scheduled for August 6, 2018! The puppet show will feature “Sing a Silly Song” with Mickey and other favorite characters. It is scheduled to begin at 5:30 pm to 6:30 pm, with a meet and greet for special photo opportunities after the show.